Motorola just held a relatively short launch event in Rio de Janeiro, Brazil. It may seem like an odd location, but the device being announced makes it absolutely clear why it chose Brazil. Simply put, the market this device is aiming at is huge in South America and parts of Asia. Particularly Brazil and India. This is about nailing the sub-$200 market. Motorola believes that 500 million people will by sub-$200 devices in 2014, and it wants to have the best device in that class. Initially, it will go on sale in Brazil and parts of Europe this week. With more parts of South America, Asia and Europe getting the device between now and January 2014. The U.S. version won’t land until January. The spec-list is pretty impressive, but is lacking on one thing: LTE. HSPA+ is as fast as this thing goes. In terms of bands (going off GSMArena specs) it supports 1900/2100 but not 1700. And, it looks like carriers won’t be offering it for sale through their own channels in the States. 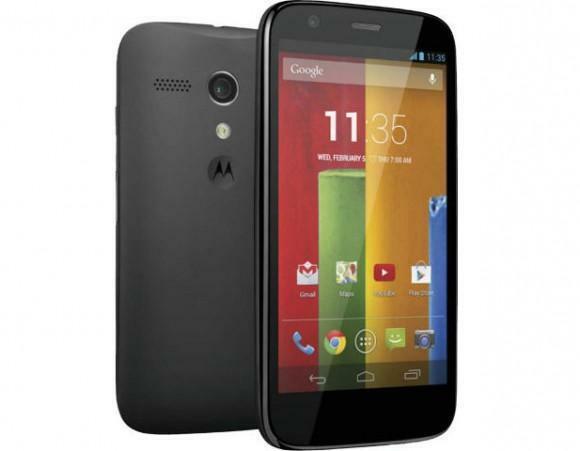 Instead, you’ll pay $179 and get the 8GB model off-contract and unlocked through Motorola.com. Unlike a lot of other devices, you only have to pay an extra $20 if you want double the storage. 16GB model will be $199. To reiterate: This is the unlocked, SIM-free cost. Motorola’s aim here is to create device that massively outperforms everything else in its class. Sub $200 handsets are generally awful, and this Moto G should be a breath of fresh air to those in developing markets like Brazil, India and other parts of Asia and South America. In the States, it could be a great option for the cost efficient among you. I’m wondering if they may have a 1700 band available for T-Mobile? I know that Verizon will have this available on their prepaid after the first of the year and its CDMA. I’m hoping that that’s what’s causing the delay. Not compatible with T-Mobile, not even launching in the US. I thought this website was TMONews, not AndroidNews. Cam, if you want folks to continue coming here for TMO news, you need to post TMO news. As I understand it, T-Mobile does support 1900/2100 in some markets and it will be available in the States come January. T-Mobile supports 1900mHz 3G/4G in some markets. 2100mHz is the downlink band for TMOs AWS spectrum and since 1700/2100 is a paired band (band 4) you can’t use TMOs 2100 without 1700. 2100mHz (Band 1, used in S. America, Asia, Africa, and Europe) is completely different. I’ve tried explaining this to so many people, but they act like I’m speaking in tongues. I’m pretty sure that the US model that launches in January will support the AWS band. Google likes T-Mobile; Android was launched on Tmo, Google has gone out of its way to add AWS bands to its Nexus devices for Tmo, and Tmo was the only carrier to sell the N4. And considering the $180 off-contract price, this phone is an attack against the contract-subsidy model and would be a perfect fit for T-Mobile–and Google knows that. I was thinking the same, because this phone seemed catered to the un-subsidised T-mobile crowd. Hope it happens. Has all the HSPA been pushed to 1900 in LTE markets or can LTE and HSPA somehow share 1700? LTE and UMTS are sharing the AWS band. Just as UMTS is sharing 1900 with GSM. They’re not sharing channels, though; they’re using different channels, just within the same band. you could root the nexus 4 and get LTE. i havent heard that yet for this thing. can have a nice $200-$500.,brick if everything don’t go right. Wow sounds like alot of power for an entry device. GREAT IDEA!! MY parent’s have older Android Phones. I wish this had been around when my Note 2 took a shower. Instead I got an S4 and sold it when I got my Note 2 fixed. $200, and no monthly payment added, is a SWEET deal for these specs. And guaranteed Kit Kat? Nice deal. Epsiblivion has the right idea, these would make a good affordable gift…for my parents who don’t use LTE data. no LTE and no 1700MHz – this really needs to be bolded and underlined…. I guess you missed the part of the article that this product is being targeted for South America? Very unlikely to sell well in the US. yup, but dont point that out to these TMo worshippers though. no 1700- not T-Mobile related. This is tmonews not phonedog. Sign me up! I’ll be getting this for a late holiday gift for someone. I know it is new but hoping for more out of a 179 dollar phone without a contract, unlocked. i don’t know how much better you could get. the n1 would still be around,they would not be on number 5. Forget cost efficient customers, this would be great to get my mother who decided to drop her HTC One S in a parking lot and lose it. Lose this and it’s only $200 I’m out. hmm. I will have to look that up. The insurance claim to replace it is $150. I’d rather spend the $100 it would take to end the contract online, get a cheap phone on EIP with Jump, and drop my overall cell bill. I can’t see sending $150 to the insurance company for them to ship a refurbished One S.
For T-Mobile, I think that the just released Samsung Galaxy Light is a better deal. Not much more money ($199 off contract at HSN dot com). Similar specs: 4″ Screen, Quad-Core Processor, 5-meg camera, 1GB Ram, 8GB storage. Plus you get LTE and an SD card slot. I wonder how much Motorola is going to loose selling these phones. I guess they don’t care being owned by Google. Google is just trying to flood the market with all these cheap phones running on Android OS. Nokia flooded the market with their cheap Symbian phones. I’m just saying. What cheap phones are flooding by Google? This is the cheapest smartphone and you get bang for your buck. Sure it isn’t gonna measure up to a iPhone or S4, but this isn’t about breaking necks with this piece of equipment, this is a strategic move to 1.) Capitalize a market of consumers untouched 2.) Slowly but surely bring those into the smartphone area. (some elderly folk who don’t want to shell out the cash for some new fangled space machine, young kids who can’t save up for a 650 iPhone) Eventually those people will buy MORE phones, and they’ll more than likely stick with what works for them, Android. Meaning google here is trying to branch out Android OS to more and more people. Smart move, smart move, smart move. good phone for the kids. With neither Band IV (1700Mhz AWS) nor LTE support, will this phone even work on the Tmobile network? I may have found some evidence to suggest the Moto G supports WCDMA 1700 bands… Stay tuned. Good move on Motorola’s part.